This big family size lasts forever even in my family of 5! Did you know that 90% of aging is called actinic aging which are the visible signs of aging and 10% of aging is intrinsic which are the physical signs of the aging process. Actinic aging we can fight effectively. It is never too early to begin fighting actinic aging. Without a plan for prevention, the repetitive eye movements that you see your kids making today are beginning of lines that will develop in their 30's. Teach them proper skin care today and prevent aging tomorrow. It is really pretty easy. Use a safe and non-toxic, organic sunscreen from 6 months of age every single day. You have heard it before, but it doesn't matter if it is the winter or summer, you need a sunscreen every single day. I love Soleo Organics and use it on my family for great protection. It is one of only a handful of sunscreens to have scored a #1 Top Rating from The Environmental Working Group (EWG). 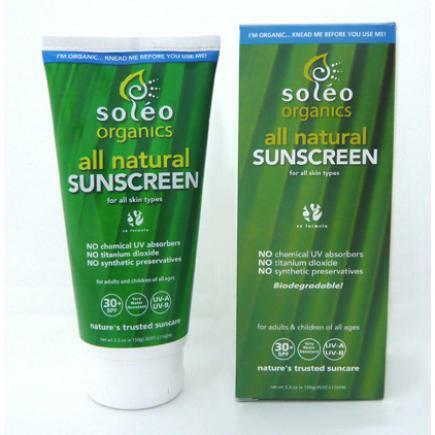 Soléo Organics All Natural Sunscreen is really one of a kind! Soléo Organics works for all ages and skin types to protect you and your children (including infants) from the harmful UVA, UVB, and UVC sun rays. Soléo does not contain any of the potentially harmful chemicals found it most other products like: Titanium Dioxide, Oxybenzone, Avobenzone, etc.. Soléo is also completely free from synthetic preservatives, is paraben and gluten free, and is not tested on animals. The only active ingredient is Zinc Oxide. Micronized particles are used (not nano) so the zinc will not leave your skin pasty white. If the sunscreen stays on white, that just means you put too much on in that particular area. Take my suggestion and rub it briskly in your hands before putting it on and it will spread a little easier. Aside from the zinc oxide, Soléo also features all organically sourced ingredients, such as grape seed oil, sunflower seed oil, macadamia seed oil, green tea extracts along with more organic ingredients. I cannot say enough about this sunscreen. It works, won't sting eyes and stays on in water. Great product to fight actinic aging!